Fantastic presentation today and a great discussion afterwards. I was thinking about our rudimentary trope-system and some of the suggestions made. Janelle mentioned Nellie Furtado’s song “I’m Like a Bird”. Though she might better serve our purposes were she Californian rather than Canadian, the lyrics of that song, with their reference to flight and escape, tap into a key value of California Culture, one that Robert Johnson’s Sweet Home Chicago hits upon as well: the desire to move unimpeded through space, bird-like, whether toward the promised land of California dreams; Gold Mountain; orange groves heavy with ripening fruit; a “virgin” territory of material wealth and possibility; or Hollywood, the center of image-production, the proving ground for luck and talent. To this thickening stew Anthony tossed in an unexpected ingredient, the Blue Angels, stationed at Miramar, whose speed and thrust exceed even the fastest of birds. I’m not sure if those navy aviators (“Don’t ever call them pilots,” my dad used to instruct me. “In the Navy pilots drive ships.”) refer to themselves or their craft as ‘birds’ or some variant, but it is interesting to note that one of the main hazards confronting fixed-wing aircraft is the dreaded “bird strike”, perhaps the ultimate (and most destructive) meeting between bird and man. In troping, ALL of this is fair game. The key is to construct a coherent system with intelligible links. What then have we got? The fabled Birdman of Alcatraz– a sinner-saint known for his terrible crime and his kindness to animals– and his Catholic correlate, St. Francis– church father, philosopher and San Francisco namesake– whose statuary is forever flecked with pigeon droppings. Complicate that pairing with the anthropomorphic Donald Duck, in some sense a monstrous Bird Man with his tortured mode of speech, his sailor suit (sans pants) and his ridiculous rages. The down-and-outer huddled on the curb buzzed on Thunderbird, taking flight of a different kind. Or the Maltese Falcon, as Maria rightly pointed out one of the most significant birds we’ve yet encountered: a bird-man artifact, a creation of human hands, a sign of tribute to the king, the central character of Hammet’s novel. 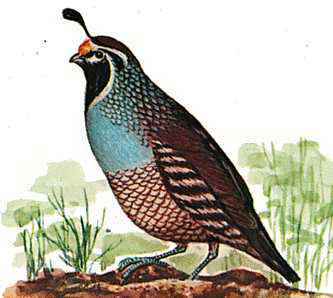 How about the state bird, the California Valley Quail? Will this symbol of California fauna fit into our system of tropes? Look where we’ve managed to travel in playing this critical game: the Hispano-Catholic origins of California culture, the military- and prison-industrial complexes of the 20th century, the Depression Era, San Francisco as a space of modernity, the innocent yet disturbing fantasy-images inscribed on the minds of children by one of Hollywood’s titans, Walt Disney. In this apparently innocuous exercise we’ve touched upon the chronic restlessness that seems to animate the California Dream, forms of social control, core institutions such as the military and the church, and mass society. Not bad. This entry was posted in California Culture, Keywords and tagged Critical Methods, Tropology on April 23, 2008 by apciv. we also have Pelican Bay State Prison. Nice. We could play with the name of that location and perhaps the term ‘jailbird.’ Also, in the 19th century it was common for upper-class observers to call poor neighborhoods (tenements, ghettos, etc) “rookeries”– i.e. the nesting places of crows. I let Connelley’s response to my suggestion to Big Bird as not being part of our trope-system marinate, and came up with this….Big Bird is not just a rollerskating, singing, muppett, he is a golden Condor, which is a fictional character. If you were to take the “Golden” and “Condor” they are not fictional but relate to the Golden state that we live in, and the Condor (not to be confused with the strip bar on Broadway) that we have in our own San Francisco zoo, it hits Cali in a big way. Furthermore if we were decenter Big Birds origin of hangin on Mr Hooper’s porch slangin rocks to Snuffleupagus smack dab in the middle of the Bronx, and reflect on the fact that there is over 33 different locally produced versions of Sesame street, ranging from Brazil, Czech Republic, or even Poland, we can see that ther is a deeper message behing his ice skating, unicycle ways.Plus its hot in those costumes. Hot like the beach. Ya! Birdman is a badass rapper from New Orleans. You guys know, Lil Wayne’s Dad. No? Never heard of him? I stumbled across Birdman the rapper in my search for other bird-men. Haven’t heard his sound.